Alcohol may protect the brain? Are you serious?? Alcohol, a drug that is a major cause of accidents, may actually protect the brain from a life-threatening injury when an accident does occur, according to a study published this week in Archives of Surgery. In the study of 38,000 patients with moderate to severe traumatic brain injuries who were admitted to U.S. hospitals between 2000 and 2005, 38 percent had alcohol in their blood. 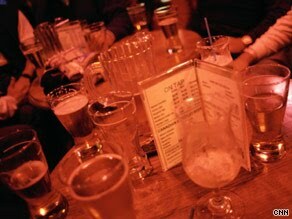 Such patients had a lower risk of dying of their injuries than those who hadn’t been drinking. Each year, about 2 million people in the U.S. experience traumatic brain injuries, and 56,000 die and 80,000 are permanently impaired as a result. Alcohol plays a role in 40 percent of car fatal crashes, and half of the patients hospitalized for trauma are intoxicated at the time of injury. The study may help experts develop therapies for traumatic brain injuries, but it has important limitations as well, Salim says. It’s not clear why alcohol might be helpful, although it could dampen the impact of catecholamines, hormones like adrenaline and dopamine that are released by the body after a traumatic injury, according to Salim. “We think [the blood alcohol] may attenuate that response,” he says. But alcohol’s beneficial effect may be severely limited, says Hovda, who was not involved with the study. He notes that the results of animal studies have been mixed. Some animal research suggests that low levels of alcohol protect the brain, but the effect is lost at higher levels; others have found that alcohol lowers survival. In the new study, researchers did not look at the amount of alcohol in the patients’ blood, but they did find that alcohol was associated with a greater risk of complications, even as it seemed to lower mortality rates. It’s not clear if alcohol could be helpful if given after an accident. “Giving patients [alcohol] after a traumatic brain injury is much different than having it on board during the traumatic brain injury,” Hovda says. The protective effect may only work when the injury occurs or may work later. “One would have to know the therapeutic time window and the dose.” Health.com: How young is your brain? Using alcohol as a therapy is unlikely, but understanding how it protects some people could help scientists develop new treatments for traumatic brain injuries, Salim says.